The company Zentralbahn ZB came into existence in 2005 as a fusion product of the private LSE Luzern-Stans-Engelbergbahn and the SBB Brünigbahn, which was a part of the federal Swiss railways SBB. 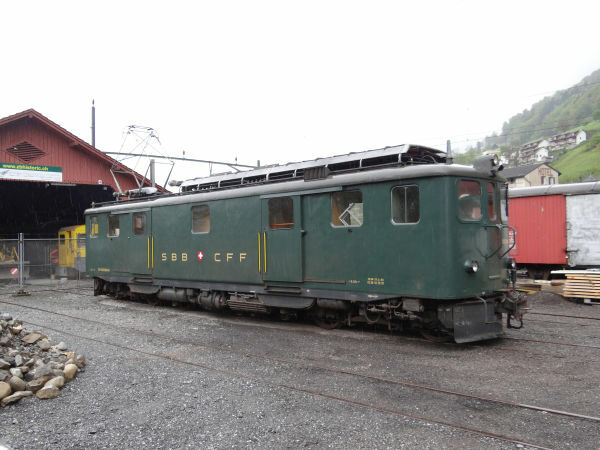 They both operated on a meter gauge network, partly three rail cogwheel. At the city of Luzern they shared a common part of track from Luzern to Stansstad. LSE's line continued from there to the famous skiing resort of Engelberg, whereas Brünigbahn's line climbed over the mountains via the Brünig pass and continued all the way to Interlaken. 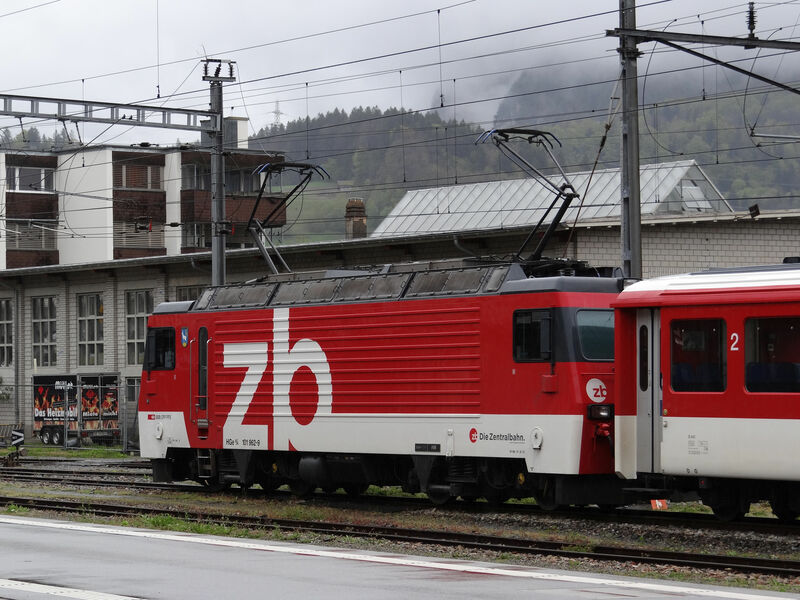 Now as Zentralbahn these two companies have continued as one. A lot of renewal work has been done. Very expensive track renewals happened at the former LSE line, including the construction of a new over 4 km long tunnel, the Grafenort to Engelberg tunnel, and Zentralbahn has also almost completely gotten rid of their old trains, replacing them with a more standardised fleet of electric multiple units built by Stadler. Flat land services close to the city of Luzern are served by trains of the type SPATZ, which has large panorama windows. 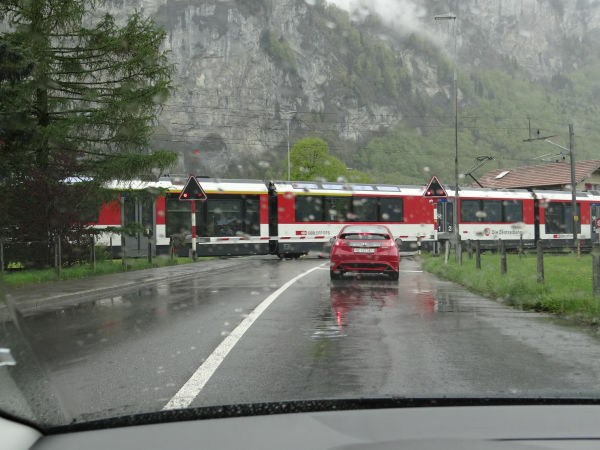 Lines climbing high up to Engelberg or over the Brünig pass are served with three rail cog wheel capable units called ADLER (a seven coaches long train) or FINK (a three coaches long fixed train). 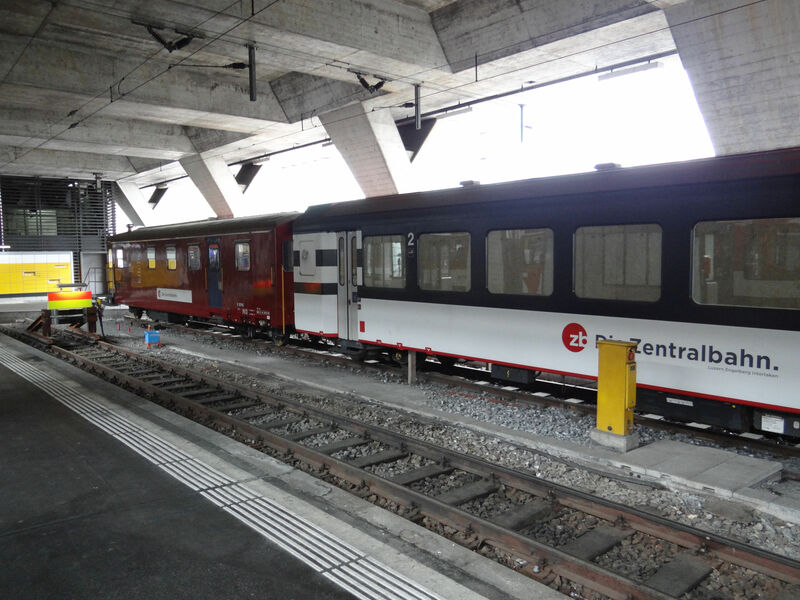 This is a three coach Stadler SPATZ class ABe 130 train with some extra old coaches fitted at the end, here ready to leave from Luzern towards the former LSE line to Engelberg. Picture from Luzern 1.5.2016 by Ilkka Siissalo. The same train as above. 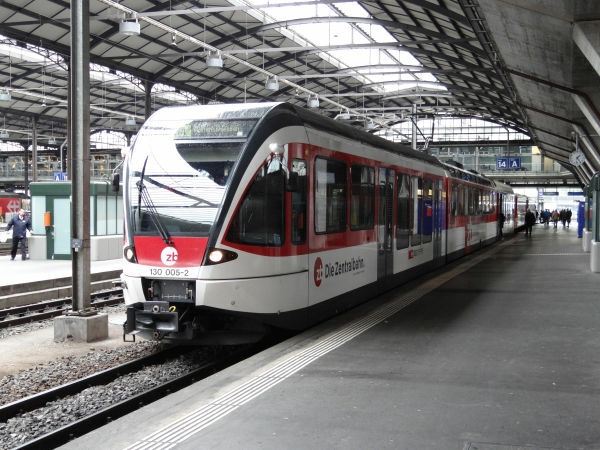 The driver's cab of a Stadler SPATZ is very similar to the ones of Stadler's GTW or FLIRT trains, but it is shorter. Still the same train as above. 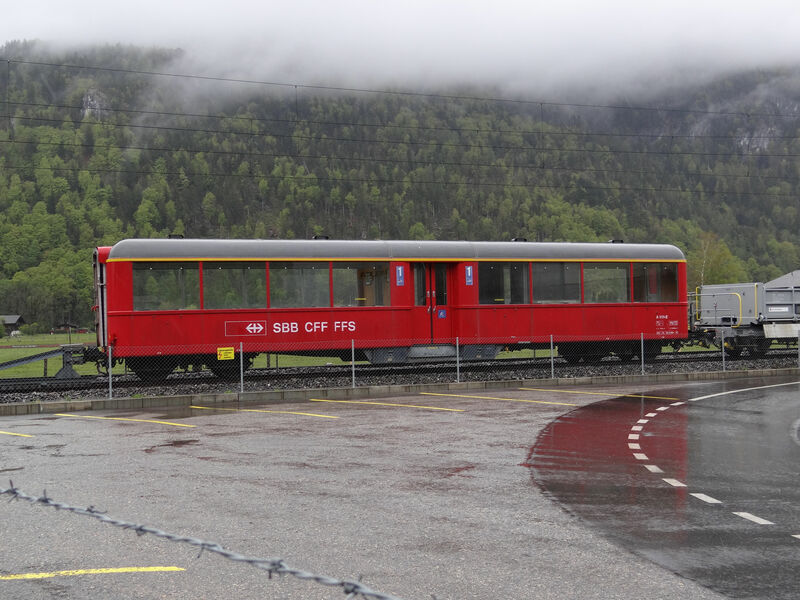 When the capacity of one three coach SPATZ unit was not enough, two old but renovated formerly LSE coaches one of which has a driver's cab were added to form a longer rush hour train. Another class ABe 130 SPATZ three coaches long train. 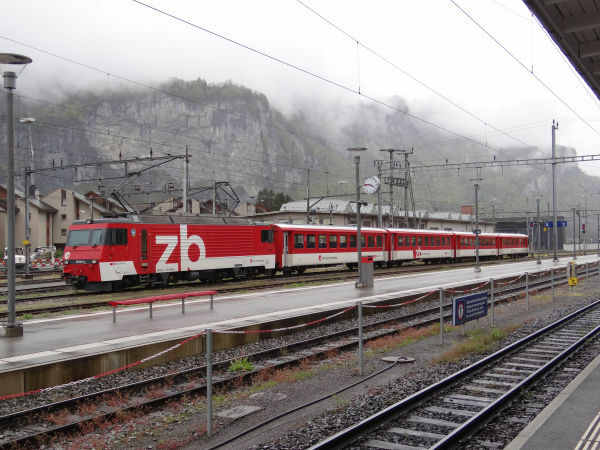 A three coaches long class ABeh 160 FINK train is arriving at the station of Luzern. The flatland route section from Interlaken Ost to Meiringen has a frequent service which is normally served by the class 130 trains which have no cog wheel third rail systems. 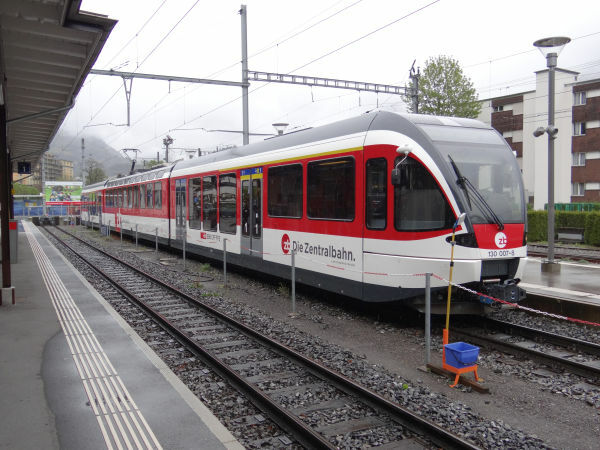 But sometines - like here - also this short route is run by ABeh 160 FINK trains, which actually do have the mountain line equipment not needed on this part of the line. Picture from Meiringen 1.5.2016 by Ilkka Siissalo. 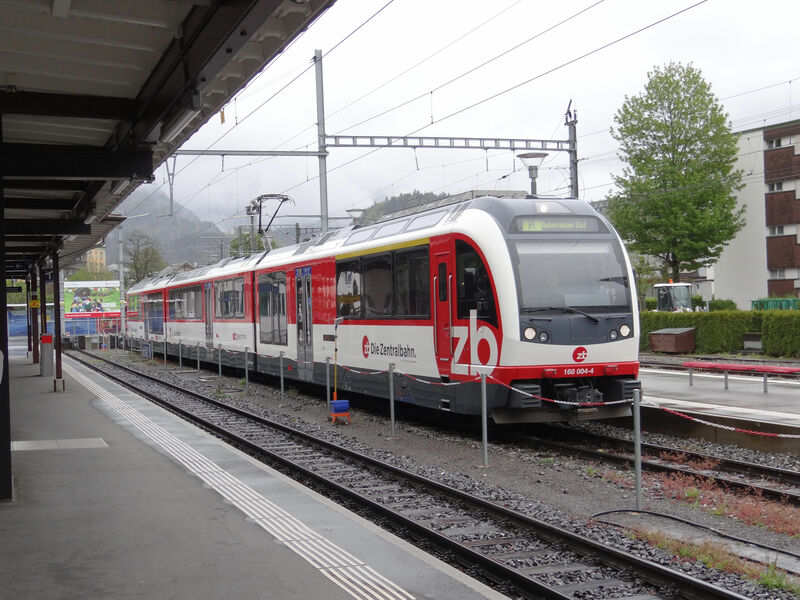 The next train on the same flatland route from Meiringen to Interlaken Ost was a class ABe 130 SPATZ. The same train as above, but seen from the other side. A class ABe 130 SPATZ. Zentralbahn InterRegio service from Interlaken to Luzern is approaching the station of Meiringen. 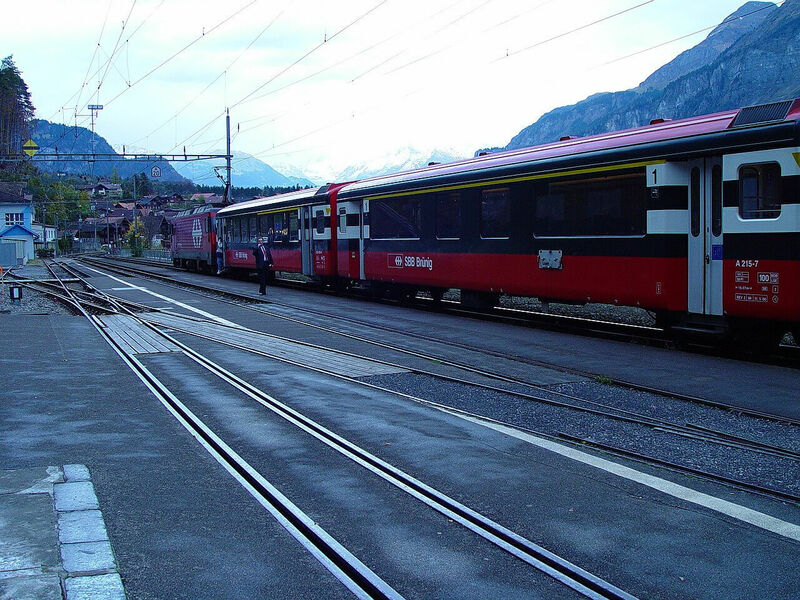 The train is composed of two class ABeh 160 FINK three coach units. An InterCity train composed of a seven coaches long Stadler ADLER plus a three coaches long Stadler FINK unit is approaching a road crossing on a rainy day and will soon reach Meiringen station. Same train as above. 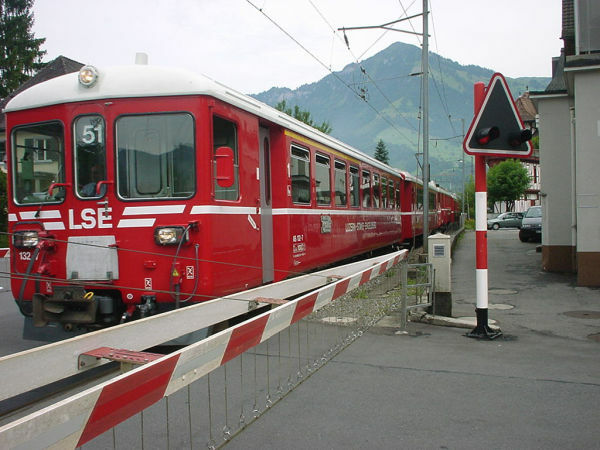 The ADLER unit is just at the level crossing. 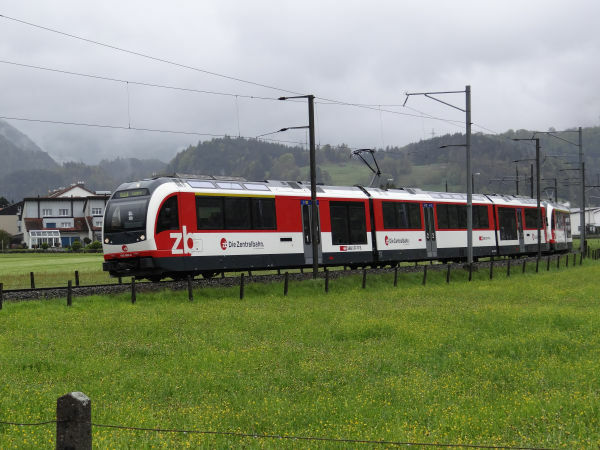 A class Abeh 161 Stadler FINK train, totally brand new and here still not even officially received from the manufacturer Stadler to Zentralbahn. 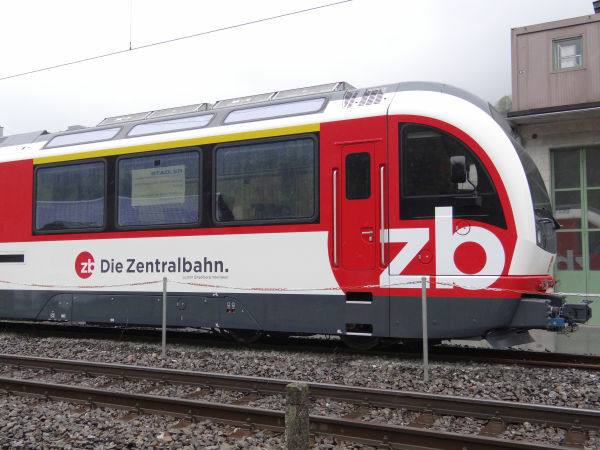 This new train is from the second generation of FINK trains. The second series has so many improvements over the first one that it was classed as class 161 instead of the original class 160. A closeup of the front of the same brand new FINK as above. Electric cog wheel rail tractor Zentralbahn Te 171 still before its modernisation. It is of the type Te III and it was built by SLM and SAAS in 1962. In 2011 this same machine was like brand new, all renovated and carried the emblem and name of the town of Meiringen.Its max speed is 60 km/h, it weighs 26 tons and has a power rating of 257 kW. 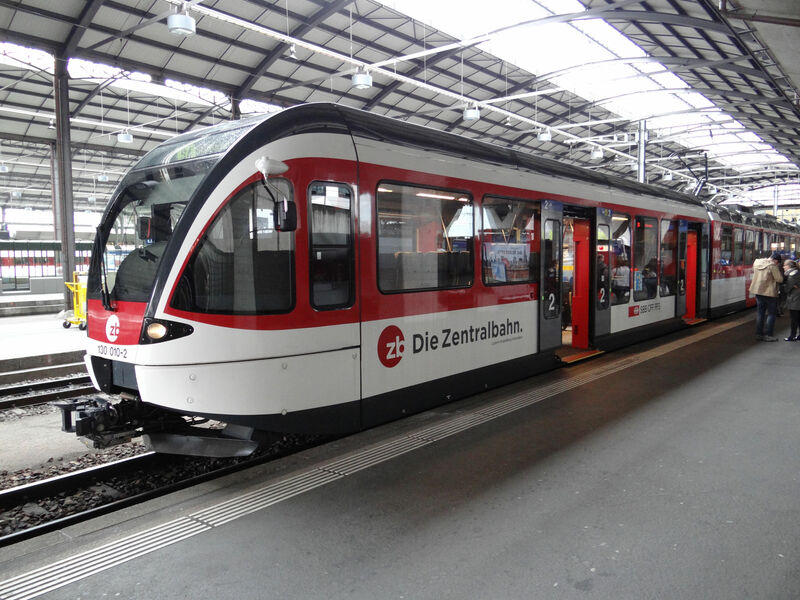 It works with 1,5 kV DC as is customary at the Zentralbahn. 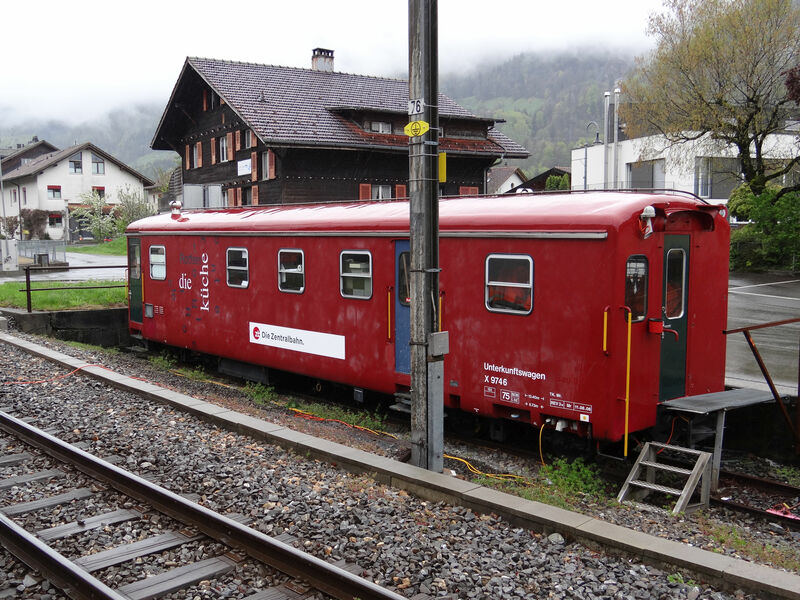 Old Brünigbahn's coaches act as a cafeteria and waiting room for Zentralbahn's personnel in Luzern. "Die Küche" = the kitchen. Another old Brünigbahn coach which now acts as a canteen and social room for Zentralbahn's workers. In the old Brünigbahn times this HGe 101 locomotive and its old coaches was the newest and finest that there ever was. But now the locomotive and its set of coaches is just a reserve that would jump in as a replacement, should some one of the new Stadler trains fail for some reason. 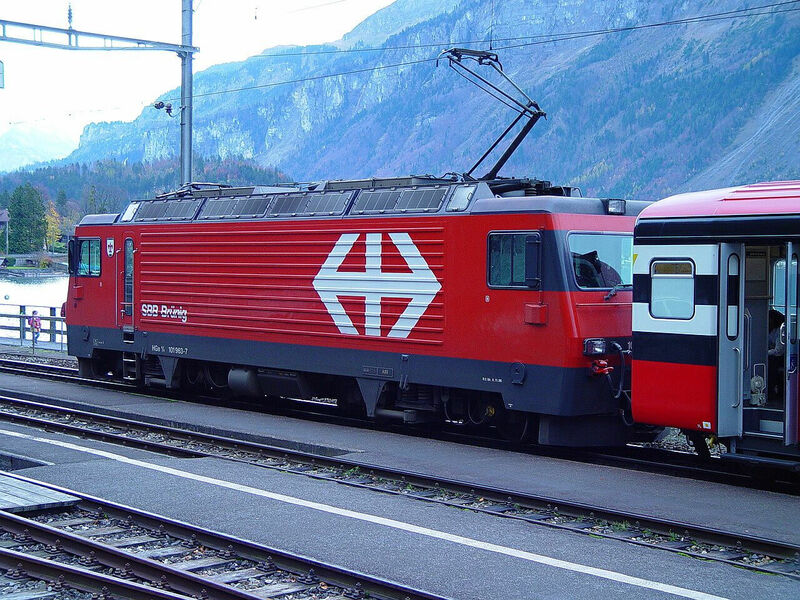 The Hge 101 (sometimes also referred to as HGe 4/4 101 or simply as HGe 4/4) was built for the companies Furka-Oberalpbahn FO (now a part of Matterhorn- Gotthardbahn MGB), Brig-Visp-Zermattbahn BVZ (now also a part of MGB) and SBB Brünigbahn, now a part of Zentralbahn. There were 5 prototypes and 16 production series locomotives and they were first run in 1985. 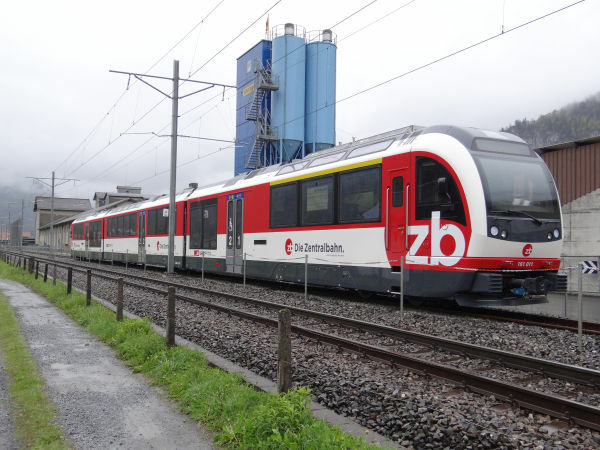 FO/BVZ/MGB machines run on 11 kV AC and these SBB Brünigbahn/Zentralbahn machines on 15 kV 16,7 Hz. Their top speed on adhesion lines on flat land is 100 km/h and 40 km/h when using third rail cog wheel drive. 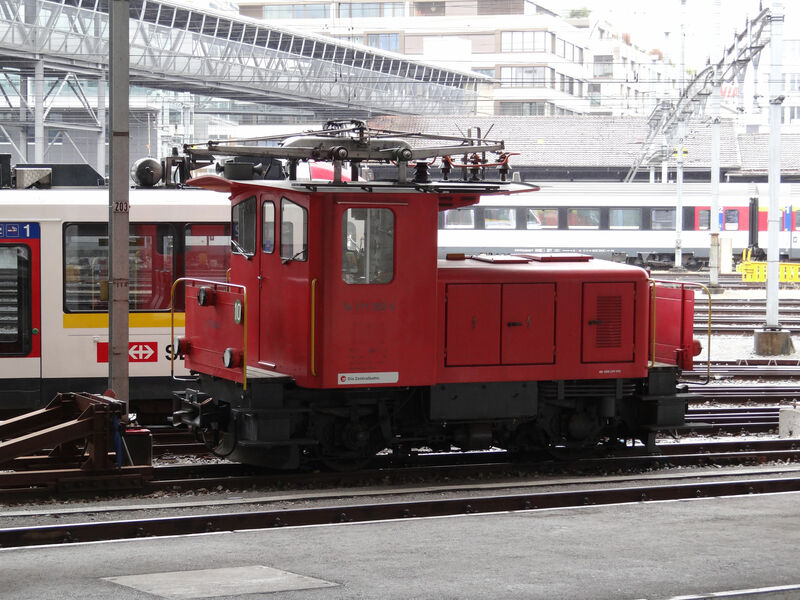 The metre gauge diesel locomotive HGm 104 no.002 seen here with a metre gauge tamper machine of the company Vanomag AG is used for track maintenance purposes. 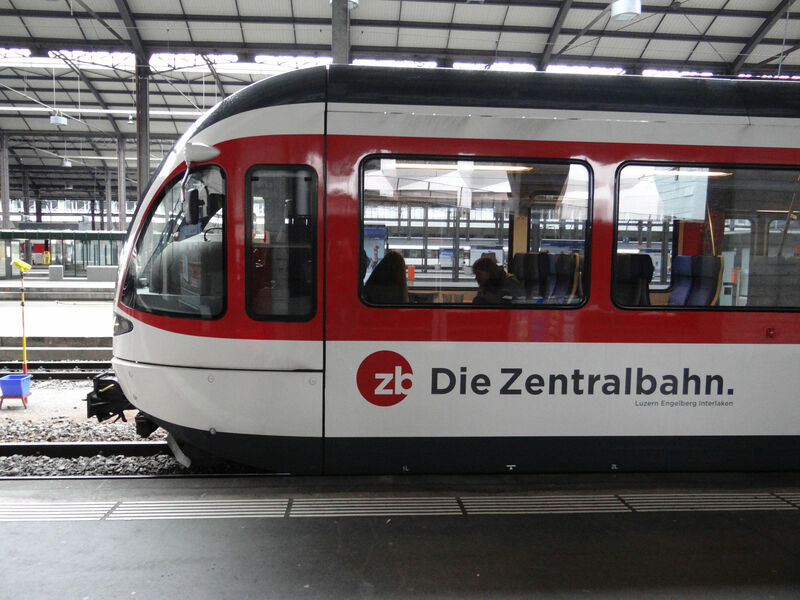 Zentralbahn has two of these machines and they are from the year 2005. They have also third rail cog wheel drives of the system Riggenbach so that they can operate on even the steepest slopes of the mountainous lines. This picture is still from the times of the old LSE Luzern-Stans-Engelbergbahn. 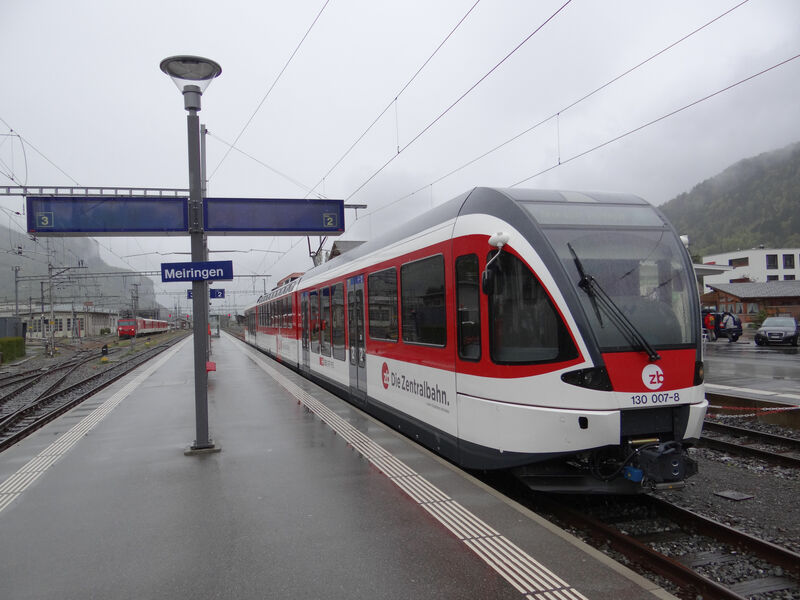 This is a flatland service, kind of a suburban commuter service between Luzern and Stansstad, here arriving at Stansstad. 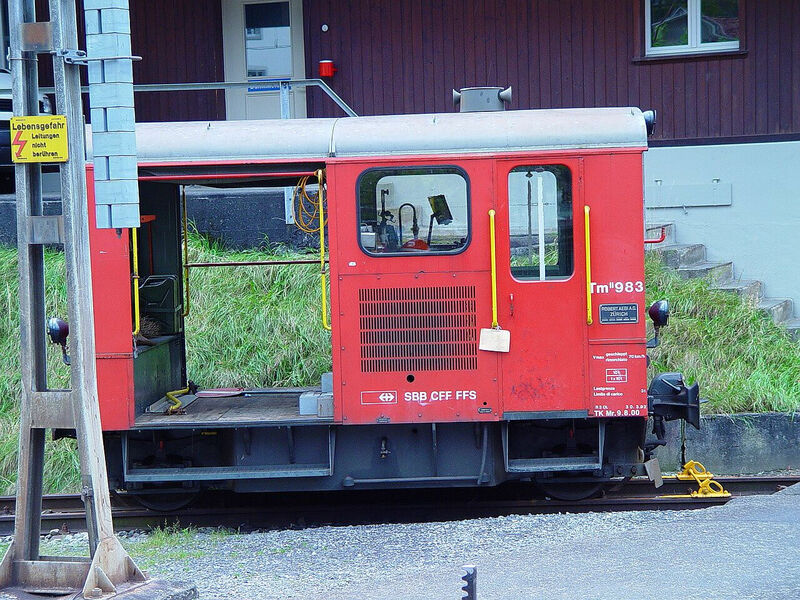 Picture of a push-pull commuter train of LSE 21.7.2002 at Stansstad by Ilkka Siissalo. This old picture is still from those times when LSE and Brünigbahn were separate. 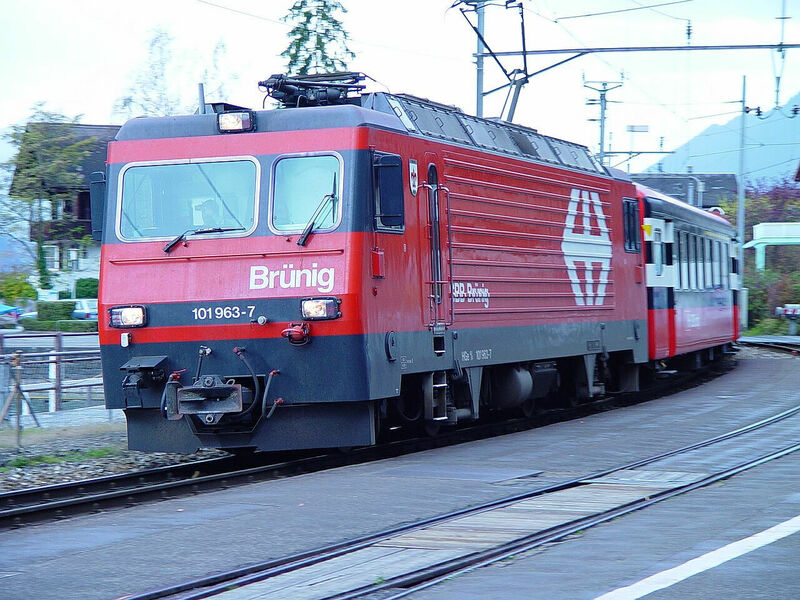 This was then Brünigbahn's fastest and finest express train with panorama coaches and a type HGe 4/4 locomotive, here still with large SBB logos on its sides. Photo by Ilkka Siissalo. Uploaded May 24, 1999. 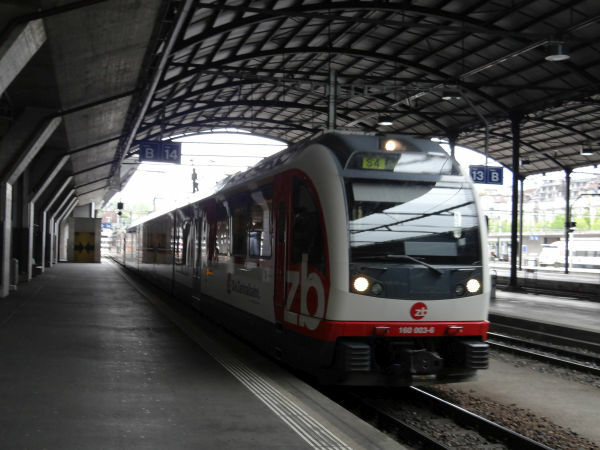 Still from the times when it was SBB Brünigbahn. A train is ready to leave from Meiringen towards Interlaken. 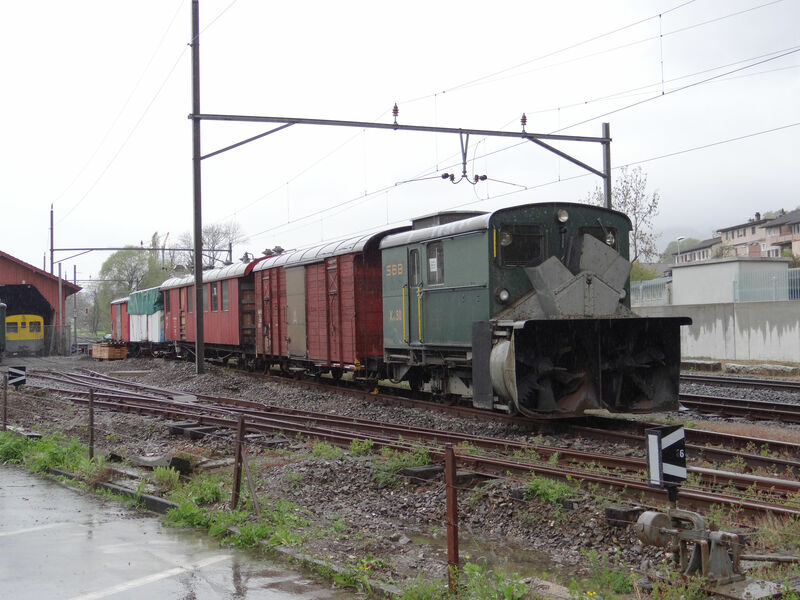 But then it was a rake of old aluminium coaches with an HGe 4/4 locomotive. Picture from Meiringen 27.10.2002 by Ilkka Siissalo. 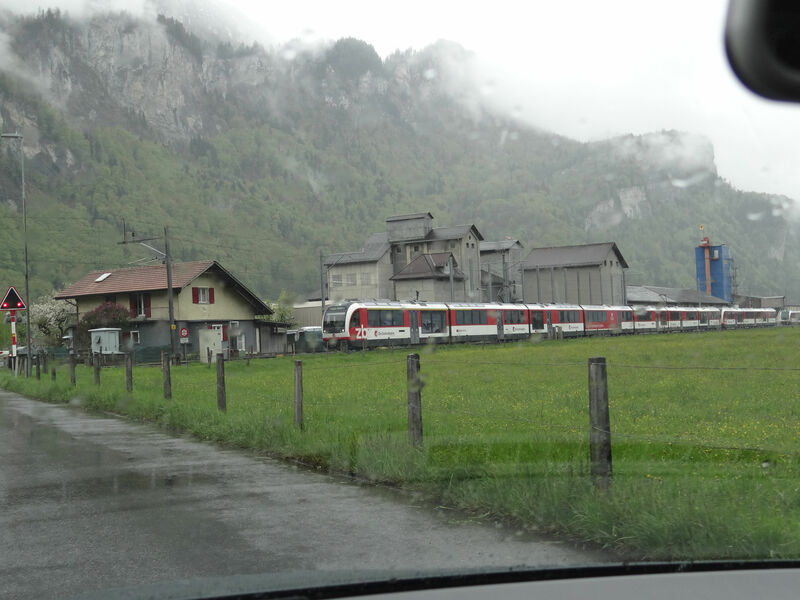 An SBB Brünigbahn train is coming from Interlaken and heading towards Luzern and is here just approaching the station of Brienz. The locomotive is - of course - again one of the HGe 101 machines. 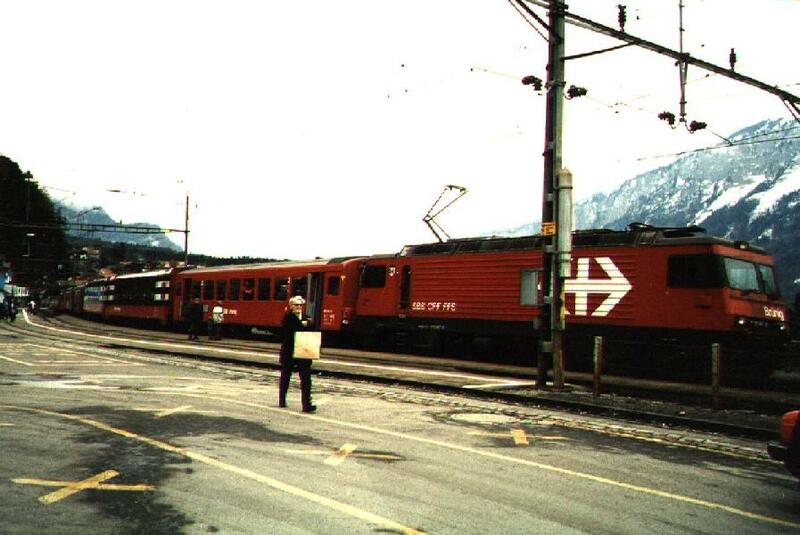 Picture from Brienz 27.10.2002 by Ilkka Siissalo. The same train as above, but now after it had stopped at the Brienz station. A closer look at the HGe 101 locomotive of the same train as above. 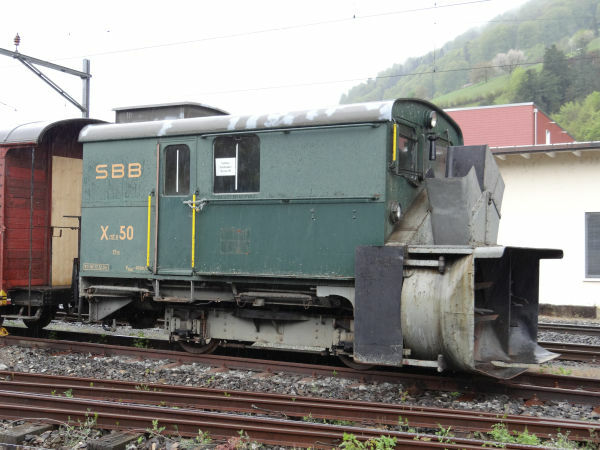 The SBB Brünigbahn narrow gauge combined cog wheel and adhesion railroad small locomotive Tmh 986 was classified as "cog wheel diesel rail tractor". 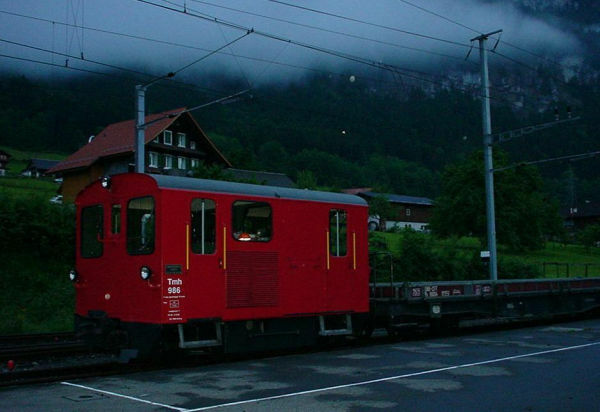 It was used in maintenance work on the steep Brünig railroad. 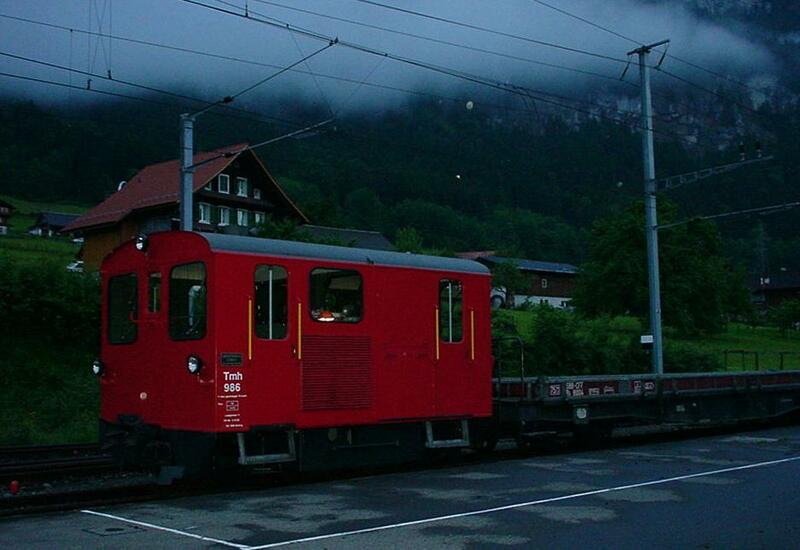 Photo from Sarnen station nighttime in June 1999 by Ilkka Siissalo. Almost, but not quite similar to the one shown above, the motorised diesel draisine Tm II no.983 was waiting at the Meiringen depot. 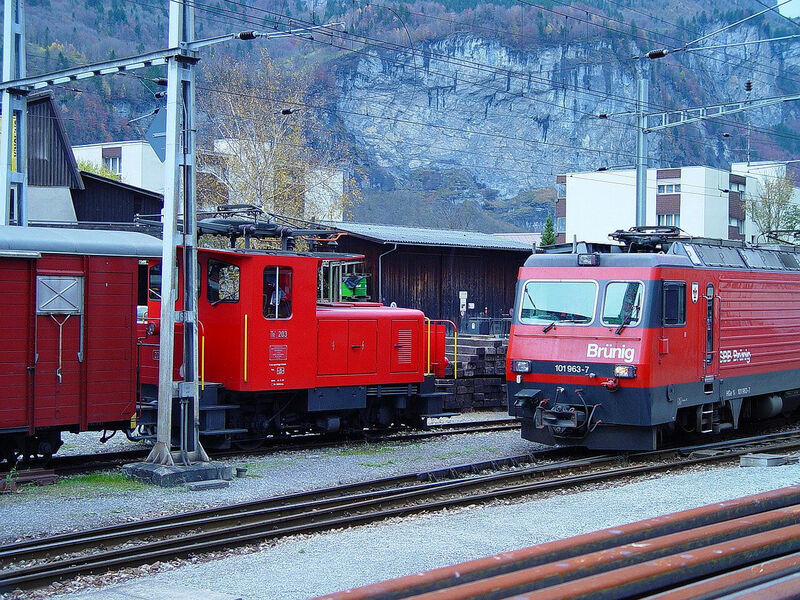 An SBB Brünigbahn class Te III electric rail tractor and an HGe 101 locomotive meeting in Meiringen. Compare the looks of the Te III with the much later taken photo of Zentralbahn Te 171 shown higher up on this same page. 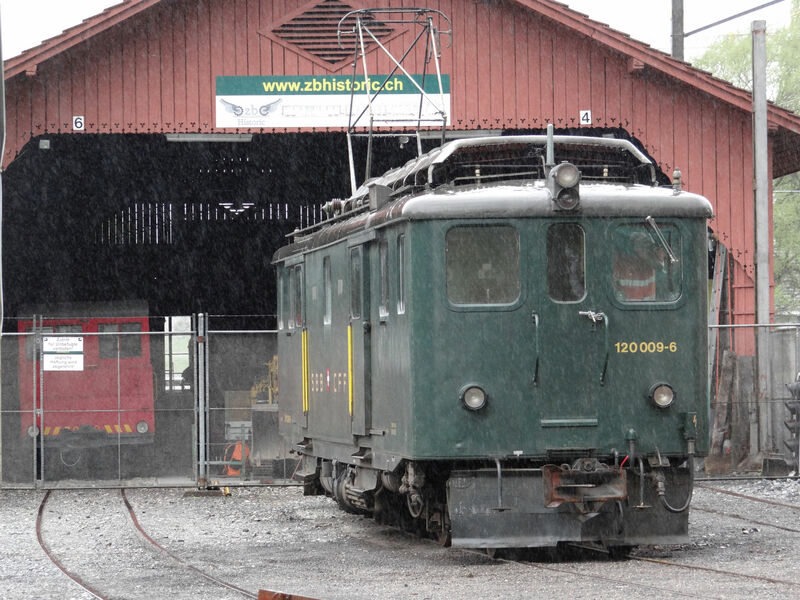 At Alpnahstadt along the Brünig pass railway line there is a small railway museum, which has preserved old equipment from times long gone. 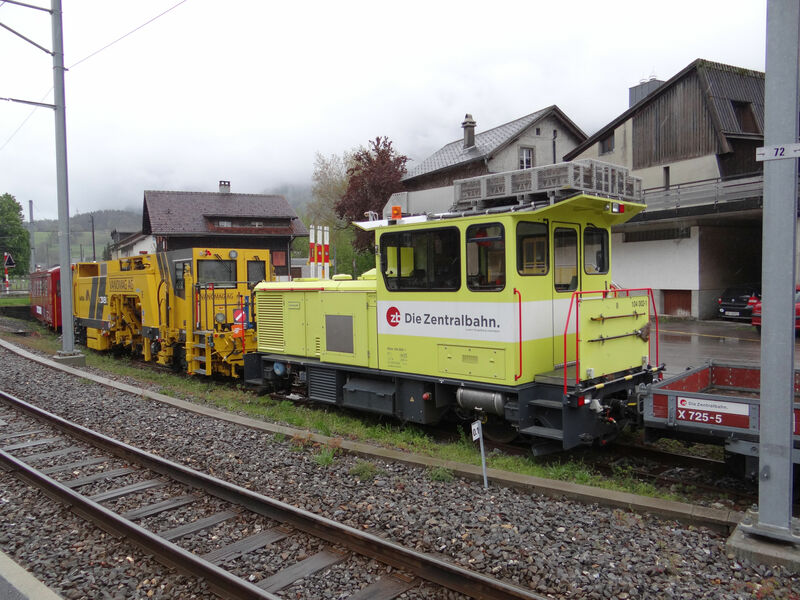 This is a rotary snow plough Xrot e50 used in former times at the Brünig pass mountain line. Picture from Alpnahstadt 1.5.2016 by Ilkka Siissalo. Same rotary snow plough as above. These class Deh 120 locomotives (actually they were classified as "Triebwagen", motor wagon and not a locomotive, because they had cargo departments) were built during the times of the second world war. This one was built in 1941. 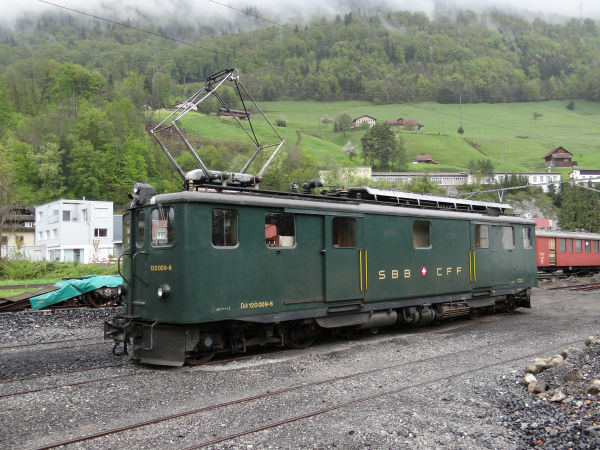 They served long times as locomotives throughout the Brünigbahn route and then later, deprived of their cog wheel mechanisms as locomotives of flat land commuter trains in the vicinity of Luzern. This one is kept at a museum at Alpnahstadt. 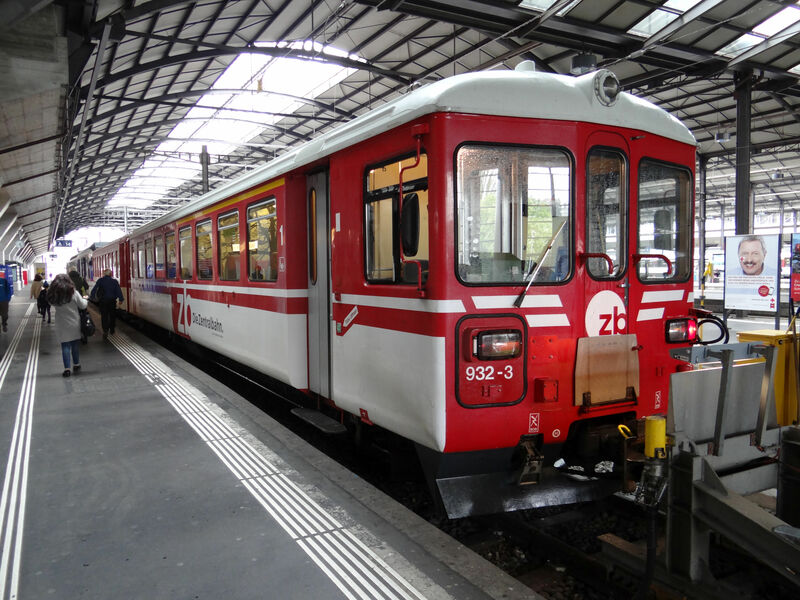 The same Deh 120 "Triebwagen" as above. This one is now again painted in its original green livery. In the 1990s they were still red. Still the same Deh 120 but seen from the other side. An old first class coach of the former SBB Brünigbahn with large panorama windows sitting idly on a side track near the Meiringen station. 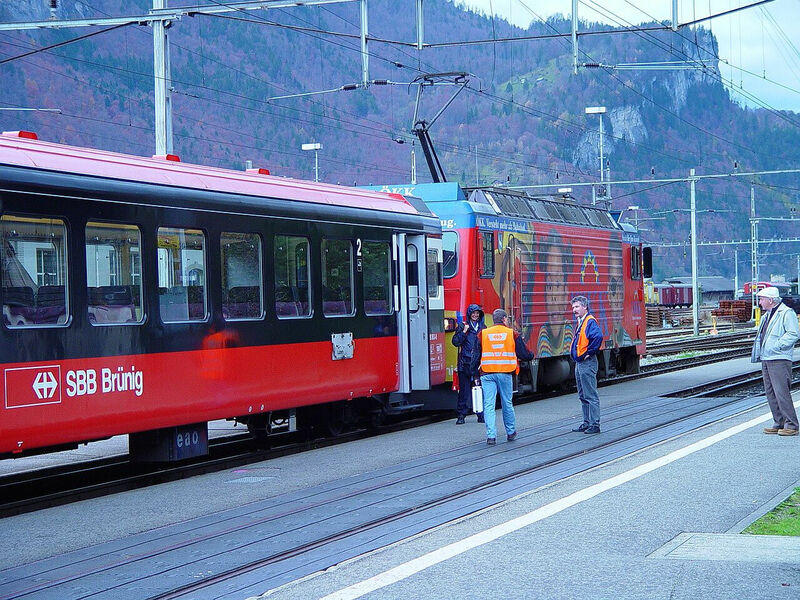 It had several stickers saying "ausrangiert" meaning it has been put out of service.